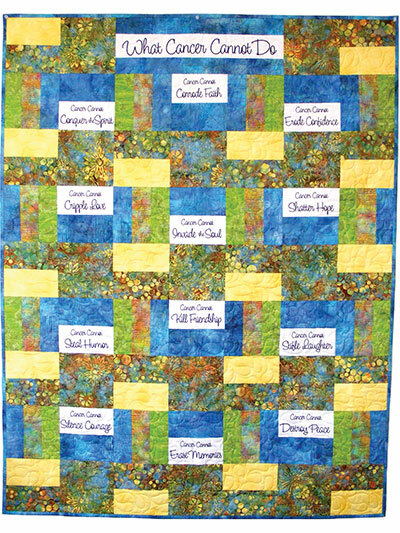 Defy cancer with the 12 inspirational quotes on the What Cancer Cannot Do Fabric Panel! If you or a loved one has ever faced cancer, you know the discouragement that diagnosis can bring. 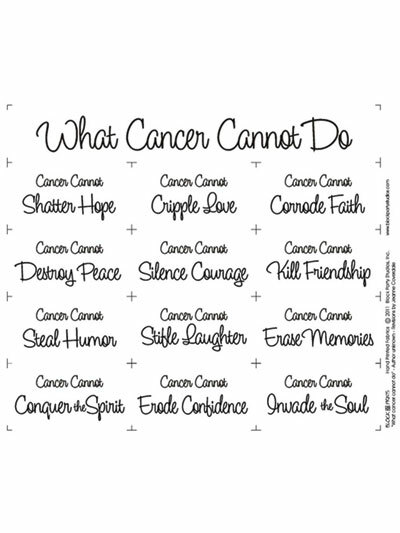 Help to lift spirits by making a quilt showcasing the quotes from the What Cancer Cannot Do Fabric Panel. Cancer may cause pain and hardship, but this fabric panel reminds us that cancer cannot shatter hope, cripple love, corrode faith, destroy peace, silence courage, kill friendship, steal humor, stifle laughter, erase memories, conquer the spirit, erode confidence or invade the soul. 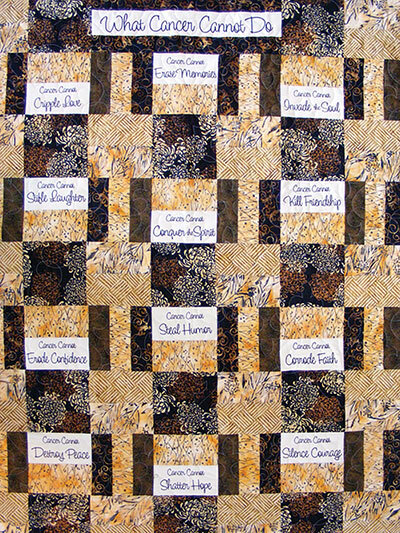 The What Cancer Cannot Do Fabric Panel's 12 blocks finish to 6" x 3". The quotes are hand printed on 100% Kona cotton in black print on natural or white cotton fabric. With just 1 fabric panel, you can make the Hope Quilt, shown below and sold separately. It took a while, but my son in law is now in remission from cancer.We have only hit the one month mark but we will have many more. Just before we got word of his good news, his wife, my daughter, was told she has cancer. Now he is helping her through the good and bad times. I plan to make this into a wall hanging using their favorite colors intertwined with each saying. I bought the panel of "What Cancer Cannot Do". I then made a lap quilt for a friend in my church that is battling cancer. I choose green colors because that was her favorite color. I wanted to give her something that would give her encouragement as she fights this battle. She loved it and wanted to show it off to everyone who came to her house to visit with her. I would urge anyone who wants to make any kind of quilt for someone battling cancer to get this panel. The words are very encouraging. I put this in a quilt for my daughter who is battling leukemia. It turned out beautiful. So many ways this panel could be used. I used it with breast cancer fabric for a wall hanging or lap quilt, but it can be used for all kinds of cancer. Many who saw it agreed with how positive the outlook can be.